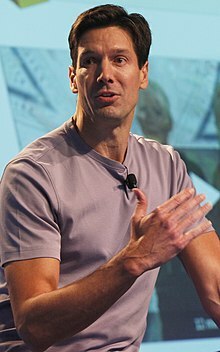 Mark Eugene Russinovich (born c. 1966) is a Spanish-born American software engineer who serves as CTO of Microsoft Azure. He was a cofounder of software producers Winternals before it was acquired by Microsoft in 2006. Russinovich was born in Salamanca, Spain and was raised in Birmingham, Alabama, United States, until he was 15, when he moved with his family to Pittsburgh, Pennsylvania. His father was a radiologist and his mother was a business administrator of his father's radiology practice in Pittsburgh. Russinovich is of Croatian ancestry. He was introduced to computers when his friend's father got an Apple II in the 1970s. He was able to reverse engineer its ROM and write programs for it. At age 15, he bought himself his first computer, a Texas Instruments TI99/4A. About six months later his parents bought him an Apple II+ from his local high school when it upgraded the computer labs to Apple IIes. He also wrote magazine articles about Apple II. In 1989, Russinovich earned his Bachelor of Science degree in computer engineering from Carnegie Mellon University, where he was a member of the Pi Kappa Alpha Beta Sigma chapter. The following year he received a Master of Science degree in computer engineering from Rensselaer Polytechnic Institute. He later returned to Carnegie Mellon, where he received a Ph.D. in computer engineering in 1994 with thesis titled Application-transparent fault management under the supervision of Zary Segall. From September 1994 through February 1996 he was a research associate with the University of Oregon's computer science department. From February through September 1996 he was a developer with NuMega Technologies, where he worked on performance monitoring software for Windows NT. In 1996, he and Bryce Cogswell cofounded Winternals Software, where Russinovich served as Chief Software Architect, and the web site sysinternals.com, where Russinovich wrote and published dozens of popular Windows administration and diagnostic utilities including Autoruns, Filemon, Regmon, Process Explorer, TCPView, and RootkitRevealer among many others. From September 1996 through September 1997 he worked as a consulting associate at OSR Open Systems Resources, Inc., a company based in Amherst, New Hampshire. From September 1997 through March 2000, he was a research staff member at IBM's Thomas J. Watson Research Center, researching operating system support for Web server acceleration and serving as an operating systems expert. Russinovich joined Microsoft in 2006, when it acquired Winternals Software. In 1996, Russinovich discovered that altering two values in the Windows Registry of the Workstation edition of Windows NT 4 would change the installation so it was recognized as a Windows NT Server and allow the installation of Microsoft BackOffice products which were licensed only for the Server edition. The registry key values were guarded by a worker thread to detect tampering, and later a program called NT Tune was released to kill the monitor thread and change the values. Russinovich wrote LiveKD, a utility included with CD Inside Windows 2000, 3rd Edition, as of 2017 freely available to download. In 2005, Russinovich discovered the Sony rootkit in Sony DRM products. Its function was to prevent users from copying their media. In January 2006, Russinovich discovered a rootkit in Norton SystemWorks by Symantec Corporation. Symantec directly removed the rootkit. He also analyzed the Windows Metafile vulnerability and concluded that it was not a deliberate backdoor. This possibility had been raised – albeit tentatively – by Steve Gibson after a cursory investigation of the nature of the exploit and its mechanism. Russinovich's novels Zero Day (foreword by Howard Schmidt) and Trojan Horse (foreword by Kevin Mitnick) were published by Thomas Dunne Books on March 15, 2011 and September 4, 2012. Both are in a series of popular techno-thrillers, that have attracted praise from industry insiders such as Mikko Hypponen and Daniel Suarez. A short story, "Operation Desolation" was published just before Trojan Horse and takes place 1 year after the events of Zero Day. Book 3, Rogue Code: A Novel (Jeff Aiken Series, May 2014) deals with vulnerabilities of the NYSE. It has a foreword by Haim Bodek, author of The Problem of HFT: Collected Writings on High Frequency Trading & Stock Market Structure Reform. Solomon, David; Russinovich, Mark (September 16, 2000). Inside Microsoft Windows 2000 (Third ed.). Microsoft Press. ISBN 0-7356-1021-5. Russinovich, Mark; Solomon, David (December 8, 2004). Microsoft Windows Internals (Fourth ed.). Microsoft Press. ISBN 0-7356-1917-4. Russinovich, Mark; Solomon, David; Ionescu, Alex (June 17, 2009). Microsoft Windows Internals (Fifth ed.). Microsoft Press. ISBN 0-7356-2530-1. Russinovich, Mark; Margosis, Aaron (July 12, 2011). Windows Sysinternals Administrator's Reference. Microsoft Press. ISBN 0-7356-5672-X. Russinovich, Mark; Solomon, David; Ionescu, Alex (April 5, 2012). Microsoft Windows Internals, Part 1 (Sixth ed.). Microsoft Press. ISBN 0-7356-4873-5. Russinovich, Mark; Solomon, David; Ionescu, Alex (October 2, 2012). Microsoft Windows Internals, Part 2 (Sixth ed.). Microsoft Press. ISBN 0-7356-6587-7. Zero Day: A Novel. Thomas Dunne Books. March 15, 2011. ISBN 0-312-61246-X. Operation Desolation: A Short Story. Thomas Dunne Books. August 7, 2012. ASIN B0080K37P2. Trojan Horse. Thomas Dunne Books. September 4, 2012. ISBN 9781250010483. Rogue Code. Thomas Dunne Books. May 20, 2014. ISBN 9781250035370. "Inside NT's Object Manager". Windows IT Pro. Penton. October 1997. "Inside NT's Scheduler Part 1". Windows IT Pro. Penton. July 1997. Archived from the original on April 12, 2013. "Inside NT's Scheduler Part 2". Windows IT Pro. Penton. August 1997. Archived from the original on April 12, 2013. "NT vs.UNIX: Is One Substantially Better". Windows IT Pro. Penton. December 1998. "Inside Encrypting File System, Part 1". Windows IT Pro. Penton. June 1999. "Inside Encrypting File System, Part 2". Windows IT Pro. Penton. June 1999. "Inside the Windows Vista Kernel: Part 1". TechNet Magazine. Microsoft. February 2007. "Inside the Windows Vista Kernel: Part 2". TechNet Magazine. Microsoft. March 2007. Archived from the original on March 31, 2007. Retrieved March 30, 2007. "Inside the Windows Vista Kernel: Part 3". TechNet Magazine. Microsoft. April 2007. "Inside Windows Vista User Account Control". TechNet Magazine. Microsoft. June 2007. "Inside Windows 7 User Account Control". TechNet Magazine. Microsoft. July 2009. "Advanced Malware Cleaning". Windows Sysinternals. Microsoft. November 2006. "Mysteries of Windows Memory Management Revealed, Part 1 of 2". Channel 9. Microsoft. October 2010. "Mysteries of Windows Memory Management Revealed, Part 2 of 2". Channel 9. Microsoft. October 2010. "Cloud Security Video: Public Cloud Security: Surviving in a Hostile Multitenant Environment – Mark Russinovich, CTO, Microsoft Azure". IP EXPO Europe. Imago Techmedia. October 2014. ^ Martinović, Ratko (October 28, 2012). "Loš PR u dijaspori – Koje su svjetski poznate osobe podrijetlom Hrvati, a da to niste ni znali" [Bad PR in the Diaspora – What are the world famous people of Croatian descent, and that you did not even know]. Dnevno.hr (in Croatian). Archived from the original on October 30, 2012. Retrieved November 27, 2012. ^ "Interview with Mark Russinovich by Microsoft Student Partners". YouTube. Google. Retrieved April 15, 2012. ^ "Mark Russinovich". Making it Big in Software. Making it Big Careers Inc. Retrieved February 13, 2011. ^ a b c "Affidavit of Mark Russinovich in Support of Plaintiffs' Motion for Final Approval of Class Action Settlement" (PDF). United States District Court Southern District of New York. SonySuit.com. April 2, 2005. ^ Andrew Schulman (September 16, 1996). "Differences Between NT Server and Workstation Are Minimal". O'Reilly and Associates. Retrieved November 16, 2005. ^ Turner, Suzi (January 11, 2006). "Symantec confesses to using rootkit technology". ZDNet. CBS Interactive. Retrieved November 6, 2012. ^ "Symantec Norton Protected Recycle Bin Exposure". Security Response. Symantec. January 10, 2006. Retrieved November 11, 2012. ^ Russinovich, Mark (January 16, 2006). "Rootkits in Commercial Software". Mark Russinovich's Blog. Winternals. Retrieved March 13, 2013. ^ Russinovich, Mark (January 19, 2006). "Inside the WMF Backdoor". Mark Russinovich's Blog. Winternals. Retrieved March 13, 2013. ^ Steve Gibson (January 12, 2006). "grc.news.feedback newsgroup". Gibson Research Corporation. Archived from the original on February 21, 2013. Retrieved November 6, 2007. "The only conclusion that can reasonably be drawn is that this was a deliberate backdoor put into all of Microsoft's recent editions of Windows." ^ a b c "Zero Day: A Novel". Amazon.com. Retrieved November 11, 2012. ^ "Trojan Horse: A Novel". Amazon.com. Retrieved November 11, 2012. ^ "Operation Desolation: A Short Story". Amazon.com. Retrieved June 1, 2014. ^ Russinovich, Mark (2014). Rogue Code: A Novel. Jeff Aiken series. foreword by Haim Bodek (son of American physicist Arie Bodek). Thomas Dunne Books. ISBN 1250035376. Retrieved November 29, 2017. This page was last edited on 24 April 2019, at 18:33 (UTC).